Canadian Foreign Affairs Minister Chrystia Freeland, left, with U.S. Trade Representative Robert Lighthizer, center, and Mexico's Secretary of Economy Ildefonso Guajardo Villarreal. WASHINGTON -- Senior ministers from the three NAFTA countries are gathering in Washington amid growing signs of optimism that they could find common ground on the toughest issues. U.S. Trade Representative Robert Lighthizer will meet with his Mexican and Canadian counterparts Friday, the first such high-level trilateral negotiating session since March 5. Talks have warmed considerably, raising hopes of some kind of agreement in principle soon despite warnings that key gaps remain. However, it remains unclear how much progress has been made -- the majority of NAFTA chapters remain unfinished and key divisive issues unresolved after months of talks. But Trump’s optimism over a NAFTA deal comes as White House officials suggest there’s wiggle room to negotiate a resolution to an escalating U.S.-China trade dispute over proposed tariffs. There are signs he’s looking to made a deal on NAFTA, too. The United States and Mexico have an "intense and dynamic relationship, which understandably also poses challenges. Nevertheless, these will never justify threatening or disrespectful attitudes between our countries," Pena Nieto said Thursday in a statement on his Twitter account. Regarding the talks, the United States is said to have softened its demands on the auto sector, a crucial area of discussion, but still is seeking controversial concessions on dairy, government procurement and a sunset clause. Friday’s meeting of the top ministers could signal the path forward -- is the Trump administration ready to bargain, or just posturing to sway public opinion as it spars with China over new tariffs? Canada’s dollar, known as the loonie, strengthened this week amid talk of a potential deal, while Mexico’s peso is trading at a six-month high. 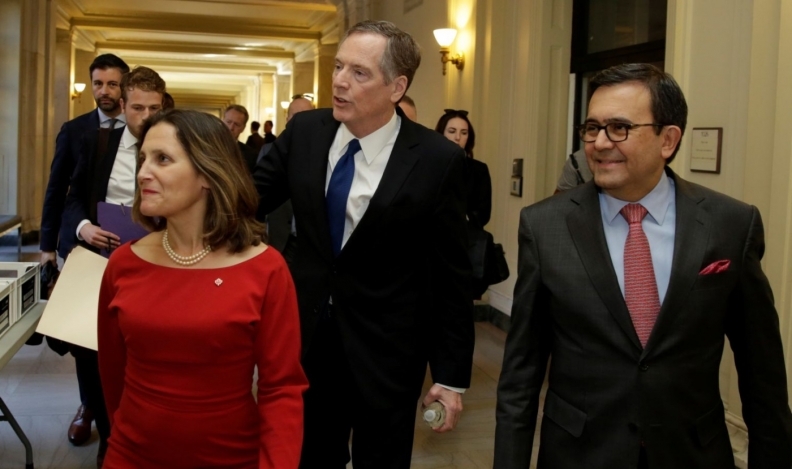 Lighthizer was scheduled to meet with Canadian Foreign Minister Chrystia Freeland and Mexican Economy Minister Ildefonso Guajardo for dinner in Washington Thursday night before the trio meet for a formal session Friday. Freeland said this week the three countries are “making some good progress,” including “promising” developments on the critical issue of the auto sector. NAFTA talks look to have put aside formal, wide-ranging rounds of negotiations for now. The United States had been expected to host one this month but has not yet scheduled it. “The NAFTA countries have been negotiating continuously on ministerial and official levels since the last formal negotiating round ended in March. Officials are continuing to meet this week as the renegotiation of NAFTA moves forward,” Emily Davis, a USTR spokeswoman, said in a written statement Thursday.